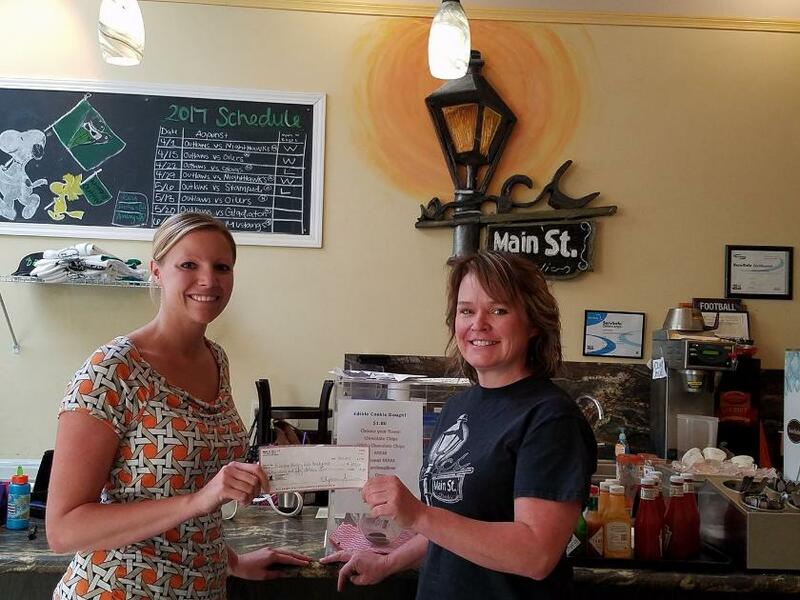 Evanston Hungry Children Backpack Program earned $150 from the main street deli selfie challenge in the month of April. A big thank you to the Evanston Regional Hospital employees for their massive food drive!! Wow! Thank you to the Evanston Fishing Derby Committee for the $500 donation! 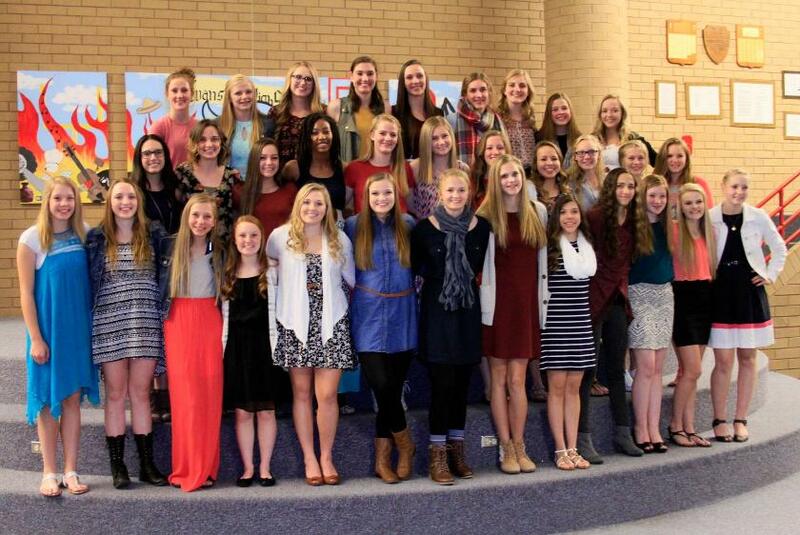 This donation will help us finish out the year! 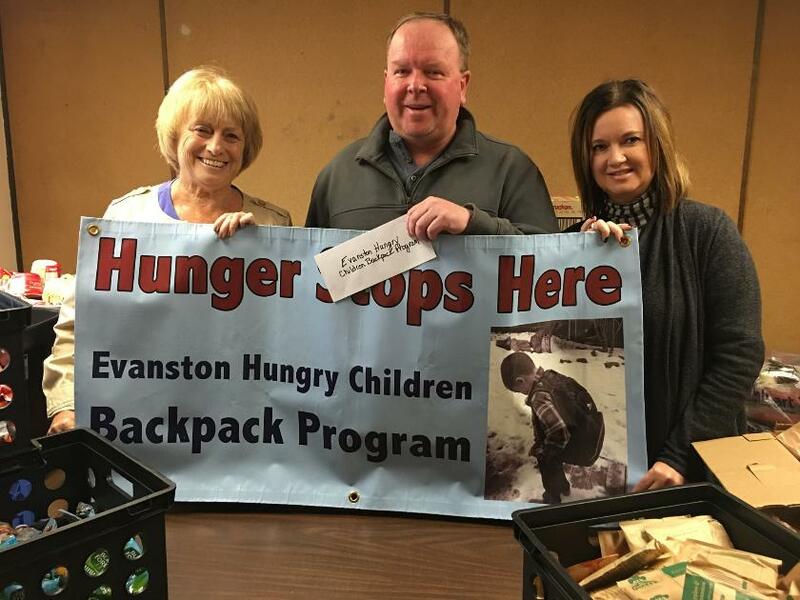 Smith's Food and Drug recently donated $2000 to the Evanston Hungry Children Backpack Program. Smith's has partnered with the Program since its inception. 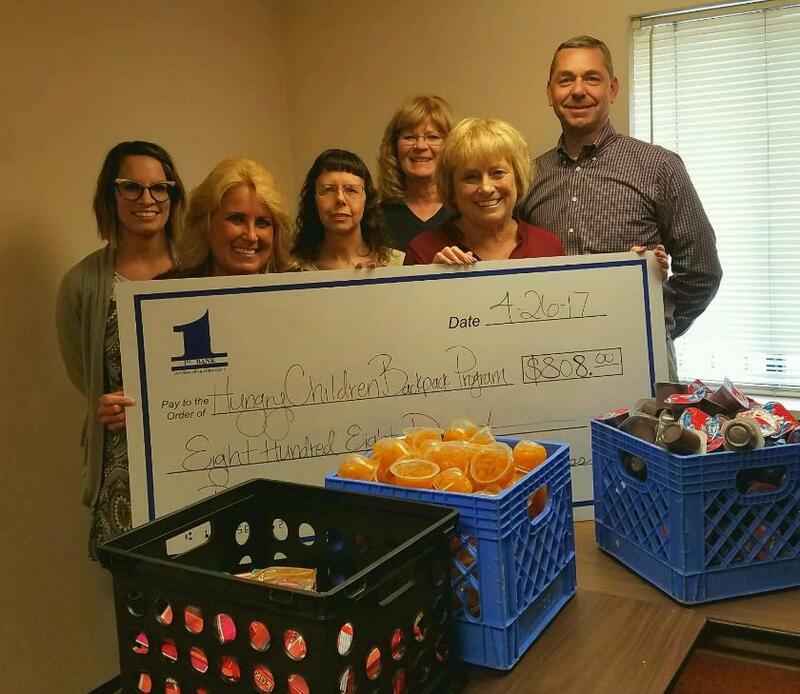 Pictured are Tanya Bower, Irene Hansen, Backpack Program, JJ Olhieser, Travis Johnson, David Smith, Warren Hales, and Shane Pace, Manager. 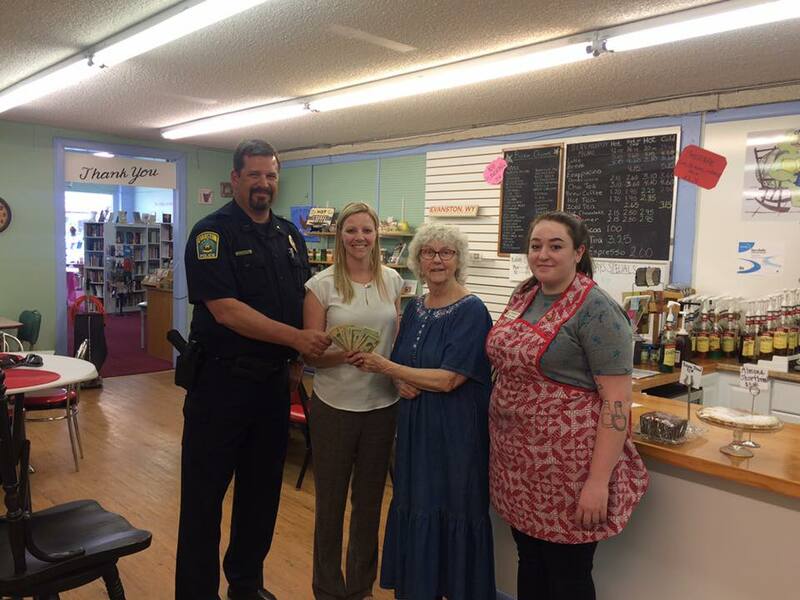 We would like to thank Serendipity for featuring us in their "pay it forward" jar this month!!! Accepting the $256 donation are Ken Pearson and Bailey Snyder,Evanston Hungry Children Backpack Program, with Kayne Pyatt and Chelsea D'Atri, Serendipity employees. 1st Bank employees Whitney Weekly, Kelli Furniss, Donna Williams, Sue Norman and Mark Smith present board member, Irene Hansen, a check for $808.00. 1st Bank employees had a "pay to wear jeans Friday" fundraiser and raised $308. The bank donated another $500.00 and also helped pack bags. Thank you 1st Bank for your support!!!!! Thank you to Mr. Ryan Berger and his class for their walkathon food drive!! 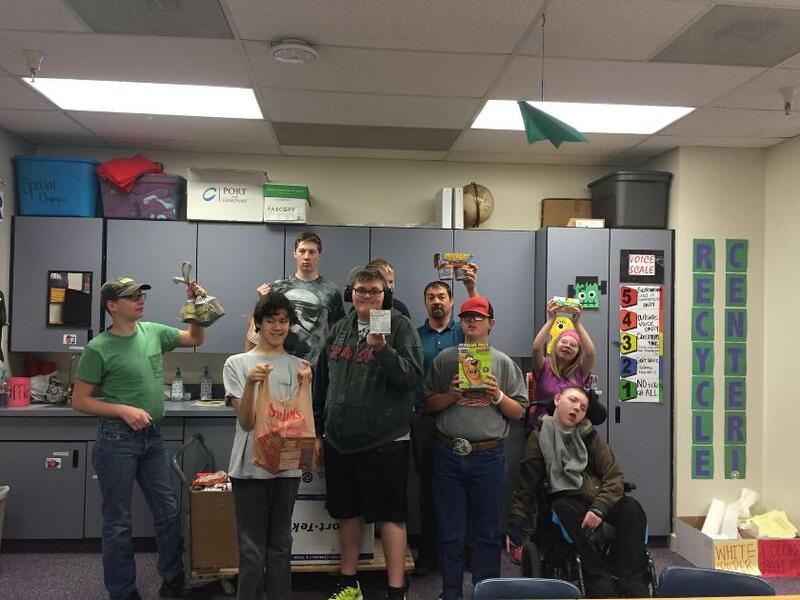 Mr. Berger and his students also deliver the bags of packed food to the schools each week!!! A huge help to us!! 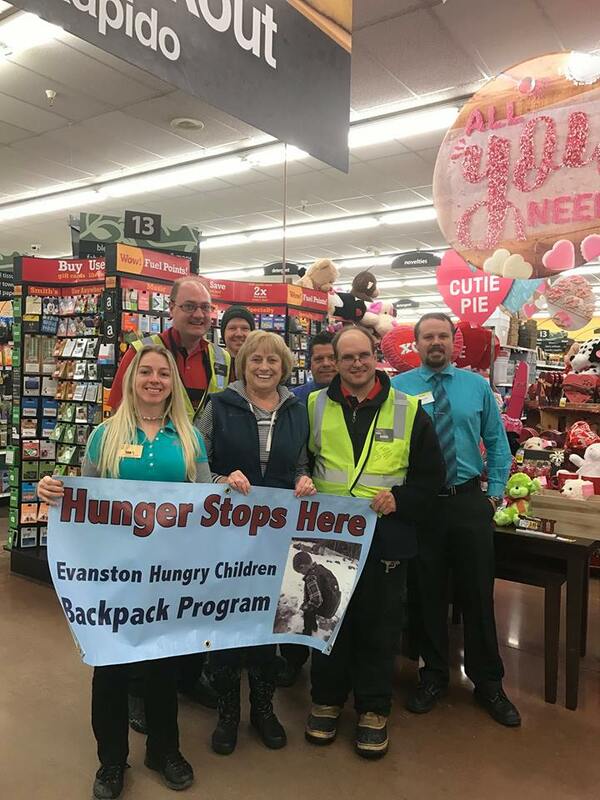 The Evanston Hungry Children Backpack Program would like to give a huge shout out to the Red Devils football team, parents, and booster moms for the donations they raised and the food drive they did for their annual banquet!! Kids helping kids/people helping people is part of what makes this community so great!!! 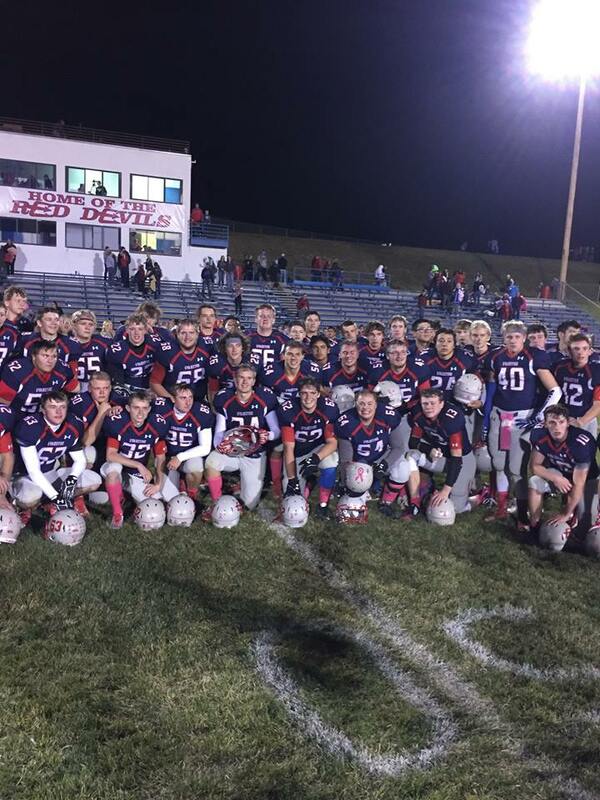 Thank you Red Devils!! Thank you attendees at the City of Evanston's Annual Meeting for both the monetary donation and the food drive!! Your generosity is so appreciated!! It is time again to thank a very generous person with a big heart. Pete Bentley donated $500 to United Way through his employer, Exxon Mobile - LaBarge, WY. Pete designated his donation to go to the Backpack Program. Thank you Pete, for your generosity and desire to help feed as many children as you can! Pete is pictured with Board members Irene Hansen and Bev Fackrell. The Backpack Program would like to extend a huge Thank You to the Evanston Red Devils volleyball team, Coaches Lawlar, Peterson, Freeland and Harold, parents and Angie Fitch for the wonderful, generous gift. Instead of families paying for their dinners at the banquet this year they were asked to make a small donation to the program. Thank each and every one of you. This community ceases to amaze us with its kind and caring people!